"Where quality extends beyond the show ring." The English Springer Spaniel has been my breed of choice since the '70s when I was kennel manager at Springcasa Kennels, working for Mrs. Kathleen Martyn, a well known ESS breeder. I selected, and fell completely in love with, a Springer puppy of my own, a lovely black & white female, who I named "Mandy". She grew up to become a Champion, my first obedience dog, my best friend, and the foundation of Nanjay's line of English Springer Spaniels. I have been fortunate to have placed my puppies in wonderful homes throughout the years, with families who love & care for them, as we do. Nanjay owners become members of our extended family, and we encourage them to keep in touch with us, always. Our lives have been enriched by these friendships & by all of these special dogs. We invite you to meet some of our beloved Springers, past & present, from eleven generations of Nanjay bloodlines. We are a small, select kennel thoughtfully breeding English Springer Spaniels for exceptional temperament, soundness, quality, dependability & good health, since 1976. Located in Caledon, Ontario, Canada. Eyes certified normal annually & hips both x-rayed and/or PennHIP-certified. Socialized, family-raised English Springer Spaniel puppies as companions, loving pets, show & obedience prospects, for the discriminating buyer. Reservations suggested. Limited Breedings. Puppies available occasionally. The English Springer Spaniel is a member of the Sporting-Gundog Group. The breed came to this continent in 1907 and was first registered in Canada in 1913 - 1914. The English Springer Spaniel has earned a reputation as an outstanding all-purpose sporting dog and has accounted for some spectacular winning in the show ring. We are pleased to present photos of many of our outstanding Nanjay English Springer Spaniels from past to present. This site contains photographs & information about our dogs (60 Champions from 1976-2004); pedigrees; pet & puppy pictures; & articles about this well-loved spaniel breed, including Puppy Training Tips, Pet Care & more. Thinking of buying a Springer? ESS Breed History, ESS Breed Standard, An English Springer Spaniel may NOT be the right dog for you, Health articles. Plus information that pertains, not just to spaniels, but to all breeds of dogs, Choosing a good breeder, FAQ (frequently asked doggy questions) etc.. Whether you are an avid collector of English Springer Spaniel items, or simply in need of a present for a Springer-loving friend, Nanjay may just have that special something you've been looking for. We like to think of these gifts as ESSentials for any Springer Spaniel enthusiast! Favourite Links to Canadian, American and British Kennel Clubs, & English Springer Spaniel Breed Clubs, ESS Grooming articles, Magazines, Health issues, English Springer Spaniel Rescue, & more. When we have a litter of English Springer Spaniel puppies, this is where we have birth announcements and display photos of pups and their mom and dad (Dam & Sire). Pups are usually spoken for before they are born. Reservations suggested. Limited Breedings. Puppies available occasionally only. Watch a litter of Nanjay English Springer Spaniel puppies as they grow. There are photos & descriptions of pups with their mom at 3 days, 14 days, 24 days, 32 days, 40 days & at 47 days. These pics were taken in Fall of 2002. Are you trying to find something on this site, for example ~ a particular Nanjay English Springer Spaniel? We have our own search engine from Freefind. When you type in a word or phrase you are looking for, you will be taken to a Search Results page. You can also Search The Web with Nanjay's Customized Google Search. 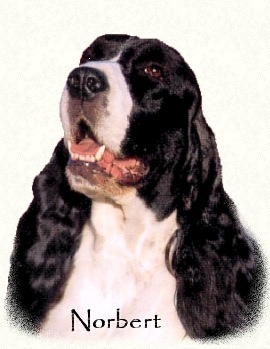 We have a total 230 pages on 'Nanjay English Springer Spaniels' site to-date. More pages & photos are added on a regular basis, so please check back often for updates, news flashes & holiday greetings. At Nanjay we take a holistic approach to dog nutrition and feed only the finest quality dog food to our Springers. Our puppies eat Solid Gold Hund-N-Flocken Puppy Food; adults eat Solid Gold Hund-N-Flocken Adult Dog Food. Even our Ragdoll cat eats Solid Gold -- cat food. We also use, and sell to our many happy clients, Solid Gold's full line of products, including Sea Meal supplement, treats, biscuits, shampoos, conditioners, & more.